What’s New in the Info Bar for 5.0 | by Drew Bennett – WELCOME TO OUR INTERNATIONAL SUPPORT! Your first question after reading the title of this article might have been as simple as, “What the heck is an Info Bar?” The Info Bar is a quick navigation tool that allows you fast access to Library Maintenance, Clocks and Schedules. At the bottom of the Info Bar are three icons or tabs for these sections of the software. The Info Bar’s drag and drop feature comes in handy quite often. It allows you to drag songs to categories when moving them, it allows you to add a category to a clock and it allows you to drop a category right into a log you’re scheduling. There’s more to the Info Bar, though, and the arrival of 5.0 brings new features. Have you ever wished for additional category information in the Info Bar? Now, you can show additional information for each category right next to the category name. To activate this feature head to Tools, Options, Library Editor Options. 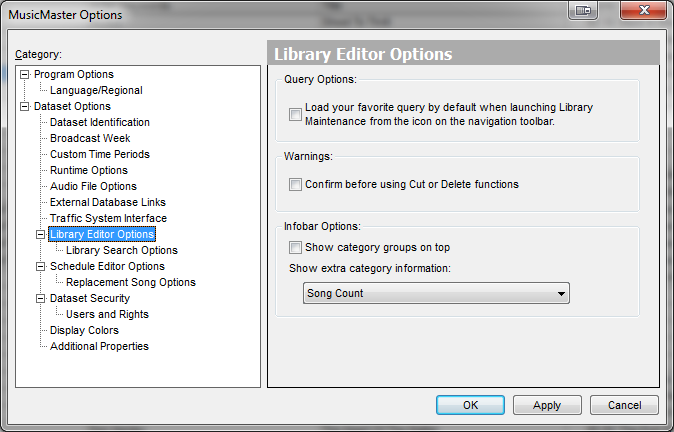 This feature allows you to select between Song Count, Slot Count or Average Runtime to be displayed with the category name in the Info Bar. The software will periodically update this information automatically for you, but you can force it to update at any time by right-clicking that panel and using the Refresh option. In the Clocks section of the Info Bar, you’ll find a new button called, Lognotes. 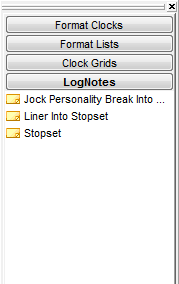 Here, every one of the lognotes you have stored in the database is ready for you to drag and drop into a clock or log. Simply open a clock or log and drag and drop a lognote from the Info Bar. It saves several keystrokes and once a lognote has been entered into the data, you’ll never have to type it out again! 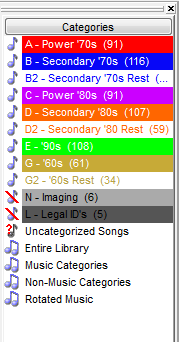 The Info Bar keeps improving with each version of the MusicMaster software. When you need it, press F11 or choose View, Info Bar. It’s a great tool to use when navigating the software and its new features in 5.0 give you more power over lognotes and a new way to display category information.